Um, YES. As I’ve noted in several other posts in this series, Caffeina has a remarkably strong secular following. Coffee shops. Songs. Bumper stickers. Greeting cards. Ornaments. Coffee Fest. And of course, coffee mugs, coffee mugs, and even coffee cups. And of course, whenever one or more people raise a mug to their lips and give thanks, it is to Caffeina they pray. Has the worship of Caffeina changed in modern times? Oh MY yes. While coffee has been a loyal companion of our kind for millennia, it is only in recent decades that Caffeina has been undeniably revealed to us, and the use of the beverage has reached a fevered pitch. Whenever ye have need of wakefulness, at least once in the day, and better it be when the sun is rising, then ye shall assemble in your kitchens and adore the essence of Me who am Queen of all Beverages. Worship of Caffeina has come a long way since she revealed herself to us, something I suspect took place in the 20th century, although I have yet to chase down the details. Now the coffee houses which are her temples often bear her name, and she brings together followers of many different paths who share devotion to her sacred brew. In fact, I’m hoping that my own Hellenic community takes a page from the Christians, and we include at least a coffee hour at our upcoming revival festival to help bring us closer together. I’d subtitle this “Caffeina’s Causes” if I were using a subtitly blog platform. onmental degradation associated with coffee cultivation, and those who work towards resolving these issues are in her favor. Caffeina is a goddess of labor, for it is she upon whose back the strain of “increased productivity” is so often borne. Caffeina is unquestionably concerned with the cradle of civilization, for the places coffee grows best are among those places longest occupied by humanity. She has walked alongside us for far longer than we have known her by name, or even the power of her sacred plant, coffee. The geopolitical upheavals undoubtedly have her attention. Caffeina craves the deep philosophy, the inspired art, the spontaneous poem, the spoken word and the political debate, that are so often awakened by her touch. As the world has grown more secularized, Caffeina stands as guide to the Muses. Not everyone asks for, or even needs, this service, but a lot more need such a boost than used to. Caffeina is interested in social justice overall, for all the reasons noted above. Ethical business dealings, proper use of political muscle, thoughtful stewardship of the environment, and incisive thinking all contribute to social justice, so surely this is not lost on the goddess. Caffeina is worshiped and honored wherever beans are roasted, joe is brewed, and morning breaks. That said, some places are particularly sacred to her. Ethiopia, for one: everyone knows that it’s the birthplace of coffee; even Starbucks says so. It’s the sort of place one might go on a once-in-a-lifetime pilgrimage to. The site of any coffee varietal sacred to your particular practice is equally valid. Roasting plants are kind of secular mystery traditions for Caffeina; few ever do more the glimpse the inner workings of these establishments. Coffee shops, of course: an awfully lot of them are actually named after Caffeina anyway, so it’s not like they aren’t expecting it. If I lived near any of these places, I’d definitely ask if I could organize a weekly prayer group to Caffeina, and if they agreed, I think it would be well-attended. 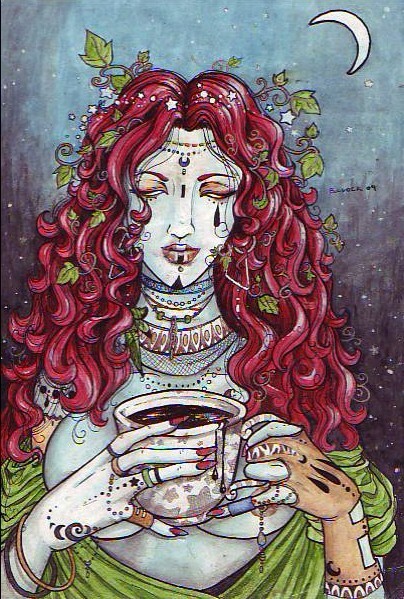 Now let’s be clear about biases: I worship Caffeina solely as the goddess of coffee, and I believe that all of her spheres of influence emanate from coffee, just as coffee itself spread over the world for the sacred mountains of Ethiopia. I’m sure that there are other places that a non-coffee-drinking Caffeina-worshiper might find sacred, but I’m simply not the priest to ask, because it is not the path I follow, nor is it the path I teach. As a found goddess, it’s more difficult to separate historically researched offerings from those discovered through personal gnosis, verified or unverified. On the other hand, it should come as no surprise that the primary offering to Caffeina is coffee. How is that coffee to be offered? It depends on how you relate to the gods in general. If you’re a Hellenic Pagan, like myself, a libation of coffee is appropriate; the theoi (gods of the Greeks) are familiar with liquid offerings being poured upon the ground. Heathens, on the other hand, might make a toast with their coffee. As I understand it, those gods accept offerings poured down the throat, rather than onto the ground. Another acceptable form is offering ground coffee to Caffeina. Note that ground coffee is not the same as coffee grounds; the latter has had the active ingredient removed and is no longer an appropriate offering. 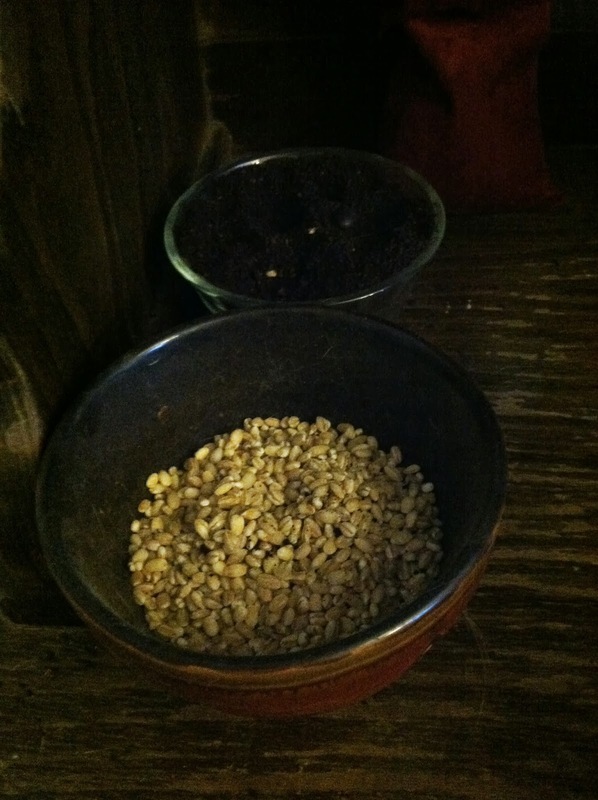 The above link describes how I tie my offerings to Caffeina to the wheel of the year by intermingling the ground coffee with barley, which makes sense since I use a lot of barley anyway. Consider that a launching pad for your own seasonal practice, and please add a comment if you have another idea that works for you. The blessed of Caffeina, those who feel powerful effects from even the slightest amounts of caffeine, may make the aroma of brewing coffee their primary offering; many gods enjoy the aromatic offerings we mortals make, and she is no different. I’m not entirely sure how one would offer caffeinated pants, but I don’t judge. As a side note, online research is getting trickier for this devotional: the top three hits for “offerings to Caffeina” in Google were written by me. Clearly Caffeina is offered more coffee than writing. The most common misconception about the goddess Caffeina is that she is responsible for your energy management. Such is not the case. Caffeina is the surge of sudden clarity you get that allows you to push through to the end of a term paper. So too is she in the rush of energy that makes the last stack of filing disappear as surely as the first. We call upon Caffeina to keep our minds sharp even as boredom and exhaustion threaten to dull our edge. But it is also true that Caffeina is near during long nights of tossing and turning. That feeling of your heart beating a bit more heavily, wary of an unknown threat? That is her touch. Jittery, anxious, insomniac . . . all these can come from a brush with this mighty goddess. The forces influenced by the gods are powerful, which is one of the reasons that these beings should be approached with respect. One does not blame Dionysos for their intoxicated driving, nor Haides for the death of a loved one, and likewise, one cannot expect Caffeina to shoulder the responsibility if her gifts are not used with care. Cast away that shame, I say! For it is not what you seem. Those who find themselves terribly sensitive to the effects of caffeine are indeed more blessed; indeed, these special few often require simply the intoxicating aroma of the brew, or even just to think of the Dark Mother herself, to be within her energetic embrace. What we of the modern world call a “caffeine problem” is in fact the mark of her most favored! So if you find yourself in such company of coffee-loving Pagans, and you do not yourself imbibe, hold your head up high, and proudly proclaim, “I am chosen by Caffeina, and have sworn an oath to take no physical caffeine while I am in her service.” For whether or not you are aware, that is indeed the compact that she is asking to make.